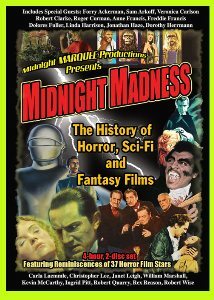 Midnight Marquee Productions presents a collection that should please virtually any fan of the horror genre past or present with Midnight Madness: The History of Horror, Sci-Fi and Fantasy Films. The collection is a 4-hour, 2-disc set that features reminiscences from 37 horror film stars including Christopher Lee, Janet Lee, William Marshall, Rex Reason, Robert Wise and a host of others with special appearances ranging from Roger Corman to such known and semi-known names as Dolores Fuller, Linda Harrison, Forry Ackermann and, well, it seems like the list just keeps going on and on. Divided into four parts; 1) The Golden Age of the Horror Film, 2) The Atomic-Crazed Fifties, 3) Teens Invade the Drive-Ins/The Studio That Dripped Blood, and 4) The Swinging Sixties to the Awesome Eighties, Midnight Madness is nicely put together by director Jeff Herberger and solidly narrated by Tom Proveaux in a way that treats the subjects well by maintaining the irreverent spirit of the project. All of the guest interviews were conducted during the FANEX conventions held in Baltimore from 1987 through 2005, a festival that was never about money as much as it was about a devoted group of film friends and fans who gathered each year and, each year, the festival seemed to grow over the course of its 19 years. If you've ever been to any of the nation's horror, sci-fi or fantasy festivals, then odds are pretty strong you'll find much to love about Midnight Madness, a collection of interviews and tributes guaranteed to trigger a trip down memory lane. Even for the names that aren't quite as familiar, a quick trip to IMDB will jog the memory of these actors and actresses and the roles that they brought to life over the years. The running time of this entire collection with all its extras actually runs well past four hours, chock full of celebrity interviews, cinematic historians, film writers, screen writers, critics and more. While the sections seem to begin with the 50's, Midnight Madness actually goes all the way back to the groundbreaking 20's. The horror convention folks, Troma fans, indie horror and sci-fi/fantasy fans will truly enjoy this marvelous collection that seems to have acquired a regular spot in this critic's DVD player as interviews get replayed, new insights are gained and memories are fondly brought to mind. For more information on Midnight Madness, visit the film's website.